إذا كنت تبحث عن عقار بموقع جيد في المدينة، فقد وجدت ضالتك في Oxygen Apartments. يسهل الوصول إلى هذا الفندق ذو 4.5 نجوم من المطار، فهو يبعد عنه مسافة 13.0 km فقط. سوف يعشق النزلاء موقع هذا الفندق، فهو قريب من أهم المعالم السياحية في المدينة . إن Oxygen Apartments حريص على توفير الراحة للنزلاء، فلا يوفر الموظفون جهداً في تقديم أفضل الخدمات وضمان حسن الاستقبال. يمكن لضيوف الفندق الاستمتاع بالميزات التالية على أرض الفندق: واي فاي مجاني في جميع الغرف, متجر, مطبخ, خدمات بريدية, تسجيل وصول/تسجيل خروج خاص. استمتع بوسائل الراحة الراقية في الغرف أثناء إقامتك هنا. بعض الغرف تتضمن تلفزيون بشاشة مسطحة, اتصال لاسلكي بالإنترنت, اتصال لاسلكي بشبكة الإنترنت (مجاني), غرف لغير المدخنين, مكيف هواء لمساعدتك على استعادة طاقتك بعد يوم طويل. إن مركز للياقة البدنية, ساونا, مسار جولف - ضمن 3 كم, حمام سباحة خارجي, سبا هو المكان الأمثل في الفندق للاسترخاء وتفريغ طاقتك بعد نهار طويل. إن Oxygen Apartments هو مكان مثالي للمسافرين الذين يتطلعون إلى الراحة والاستجمام في المدينة. مكتب الإستقبال مفتوح من 08:00 AM إلى 06:00 PM خلال أيام الأسبوع و من 09:00 AM إلى 12:00 PM خلال عطلة نهاية الأسبوع. على الضيوف الذين سيصلون خارج هذا التوقيت أن يتواصلوا مباشرة مع العقار قبل وصولهم ليت ترتيب هذا الامر. يُرجى العلم بأنه يتوفر للنزلاء مكان لانتظار السيارات بقيمة 25 دولارًا أستراليًا تغطي مدة الإقامة. تتوافر خدمة انتظار السيارات دون رسوم إضافية. We have stayed multiple times at Oxygen apartments over the years. It’s our go to for accommodation in Brisbane. The young man at reception (I think his name is Henry) was absolutely fabulous. He was so great when we checked in, and even printed out our concert tickets for us. He really is wonderful to deal with. Overall we had a wonderful stay. We will definitely be back! Is this supposed to be 4 star? Tired and shabby dunar (more like a fitted bed protector masquerading as a dunar), clean but stained towels, odds & ends equipped kitchen, weathered look, cleaners doing the absolute bare basics (thick dust on bed sides). Guys seriously, .service your air con units (they smell), get new (and proper) linen (its not hard and it would make a huge difference). Pros: fair prices, gas stove (cooking with gas baby! ), accomodating/good service from the old dude @ reception (in spite of my late checkin) and handy to brisbane cbd. It is what it is....it just isn't really for me. We loved the apartment. To improve further: Main area particularly flooring could do with some tlc. Although spacious, the bedrooms were all adjacent to the main living area and it wasn't very sound proofed so lacked privacy ( if more than a nuclear family stayed- we had grandma) and adult entertainment after kids went to bed needed to be quiet. It lacked a BBQ on the fab balcony which was a shame as the gas connection was there. We would definitely book again but would bring a BBQ with us! Check in was great ( after hours) and the pool and garden area was beautiful ( and empty!) Shane and any staff we had dealings with were great. Thanks for a great stay Oxygen. Already looking forward to the next time! Staff very responsive to requests. Supermarket Woolworth is located nearby. Free secured car park. Korean mart & Pizza restaurant located just downstairs. Lift broke down on check-in day. Had to climb up steep stairs to my unit at level 6. Waited for 3 hrs+ to get the lift fixed in order to bring our heavy luggage up to the unit. Precious time was wasted. Otherwise the room is clean & comfy. Close to the city; reasonably spacious; free parking and wifi. We chose the Oxygen apartments due to their proximity to the city, wifi was included in the price, and we preferred a loft apartment. Plus they had a very good rating overall from various web sites. We arrived outside of their regular check-in time, but it wasn't much of a hassle to get our keys and car parking instructions. Pros: The apartment was clean and spacious. There were sufficient initial supplies of toiletries, washing powder and dish washing products, etc. Cons: The bed in the room was totally inadequate - it was very uncomfortable, and the mattress was less than half the thickness of any "regular" mattress. Access to the apartment from the lifts could be a problem during rainy weather, with little overhead protection. The garbage chute was convenient, but it stank and smelt very "sour", it didn't appear to have been cleaned on a regular basis. Our family enjoyed our stay at Oxygen apartments. The rooms were huge and the pool and spa were great. Having shops within walking distance is also a bonus. The staffs at the reception are not very friendly. There is no daily housekeeping for the rooms. We have to ask for Dishwashing detergent and toilet rolls constantly. The rooms are dirty after 1-2 days stay as there is no housekeeping provided unlike the previous apartment . 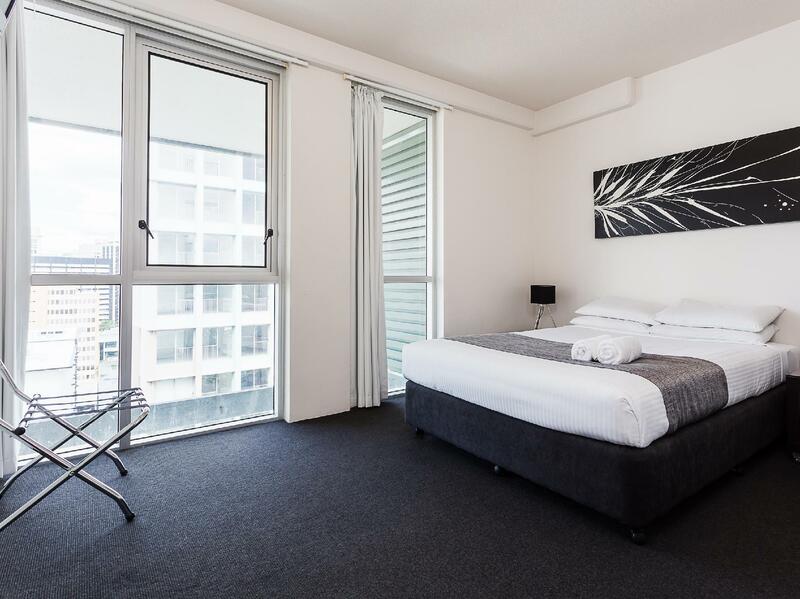 We had a very pleasant stay at Oxygen Apartments at Brisbane. The apartment is located at central location. Rooms are very clean and well arranged with good furniture. We will stay here again. We arrived after 8pm, no receptionist - counter is closed - I thought that was impersonal, everything was left in the safe box with instructions of where to go, also if you arrive after 8pm nothing is opened for meals, hoping the pizza shop opening next door is opened late otherwise you would be eating from the 7/11 shop next door. Apart from this the hotel is very clean and located in a very quiet area about 10 - 15 minutes walk to Brisbane Chinatown. We would stay here again. I stay here fairly regularly (when price is reasonable). There is always something questionable about the cleaning, on this occasion was the gym. Not sure the equipment has been cleaned for sometime...But if you can deal with that, the rest of the features of the apartments are ok to good.